A Camellia japonica L. cultivar. ‘Woodsii’ has very regular pale red flowers, to 10cm across, with 3 rows of large outer petals and smaller, erect inner petals, somewhat like ‘Waratah’. It bears fine, large, cup-shaped, deep pink or red flowers. [ICR]. ‘Leaves twenty lines wide and three inches and ten lines long; lanceolate, acuminated, a little dentated, of a deep green; handsome port; bud very long, oblong, scales blackish; flower very large, three inches in diameter, petals unequal. The flower resembles a Provence rose; blooms with difficulty. – Superb.’ [Berlèse Monography p.72/1838]. A seedling of ‘Waratah’, it was raised by Chandler about 1819. [ICR]. Berlèse Iconographie vol.I pl.84/1841. Listed in the 1845, 1850 and 1857 catalogues. 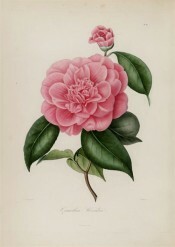 ‘Woodsii’ was among the camellias positively identified at Camden Park by Walter Hazlewood in the 1930’s. He described it then as ‘salmon red, 2 rows of outer petals, centre confused, with stamens showing, immense bloom’. [TJSC]. Listed in both the 1830 and 1836 editions of Loddiges’ Nursery catalogue, copies of which are held at Camden Park. Marked ‘o’ in the 1836 edition, indicating new to the colony. Probably obtained from Loddiges’ Nursery, either in a case of plants brought back by Bidwill or in a direct importation in late 1844. Concerning the latter Macarthur wrote on 6th January 1845 that he now had five camellia ‘which we had not before’, and of the former that he had saved 60% of the plants: ‘You will judge therefore how much I am in your debt’. [MP A2933-2, p.28].